If you had asked Kyle Harder R’06 two years ago if he thought he would one day co-own Sniff-Stick, a company that boasts a portable aromatherapy product, he would have looked at you like you were crazy. Two years later, Kyle is using the product regularly before going running or heading into an important meeting. Dan Brunt and Chris Genualdi R’09 were winners of the 2009 Robins School Business Pitch competition for their proposal of Sniff-Stick which has now evolved into the name AromaGo. Since winning the contest last year, Dan, Chris and Kyle have been busy starting up their company with their $2K contest earnings. The concept for AromaGo first began when Dan and Chris took a semester to study abroad two years ago. 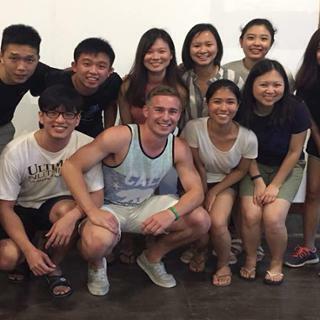 “I studied abroad in Bihar, India, and was lucky enough to be able to take a one-month trip to Thailand where Dan was studying. [I learned that] essential oils are everywhere in Thailand; the locals love them,” said Chris. After putting the concept of Sniff-Stick into being and winning the Business Pitch Competition, the two-man team decided to bring Kyle on to generate even more traction. “When Kyle got involved, we started pushing forward with intentions of at least learning as much as possible about the market for essential oils and aromatherapy in the United States,” said Dan. The pre-planning process of AromaGo was challenging because all three members of the company were located in different states. Kyle was working in Massachusetts; Chris was in New Jersey, and Dan lived in Colorado. “We traded a thousand emails back and forth, coming up with the design. The end product has an applicator end and an inhaler end,” Kyle explained. Each person serves a distinct and integral role within AromaGo. Kyle handles the sales, marketing and business development. He also manages the team’s PayPal account on AromaGo’s website. Chris is in charge of operations, processing the shipments, and packing and distributing the product. “If something needs to ‘get done,’ Chris makes it happen. Chris designed the logo, built the input supply chain from scratch, and now fulfills each order received through the website,” said Kyle. Dan is the mastermind behind it all: “He drives creative strategy and vision. We all view Dan as the CEO,” Kyle said. This August, the entire AromaGo team will finally be in New York City together. Even miles away from the University of Richmond, Dan, Kyle and Chris find themselves still reaching out to their network that started here. “Once you graduate, you are just leaving the campus not the University. The alumni network and being able to follow up with people especially on Facebook has been really critical,” Kyle said. In fact, it is this shared camaraderie and love for this campus that drives Kyle as an entrepreneur: “People love this University and this gives me confidence that other people would love this product,” he said. One course at the Robins School changed a student's mind to pursue a career in a field far from what he had imagined for himself. 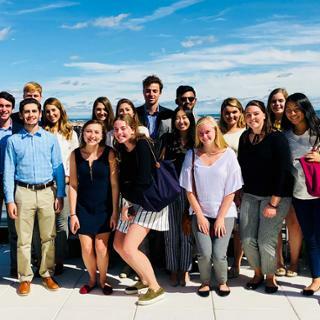 20 students went to Washington, D.C. to meet with alumni and learn about the marketing and communications industry in the region.